In its early years, Red Bank was a place where Sigmund Eisner, a Jewish emigrant from Austria, could arrive with empty hands and build a manufacturing empire that served the nation. It is a place where families like the Irwins could make a home for generations: Capt. Edward Irwin started his marine business by the side of Red Bank's Navesink River in 1884, and his great-grandson Channing still runs the family marina by the water. It is the place where Thomas Edison experimented with sonar and where the Dorn family launched a photographic dynasty that has chronicled the life of the community for more than a century. It is a place where the Drs. Parker, a family of black physicians, earned an enduring place in the hearts of Red Bankers by caring for its citizens, both black and white, with skill and kindness. Red Bank is a place where Bruce Springsteen could start off playing at high school dances and end up in the Rock and Roll Hall of Fame. 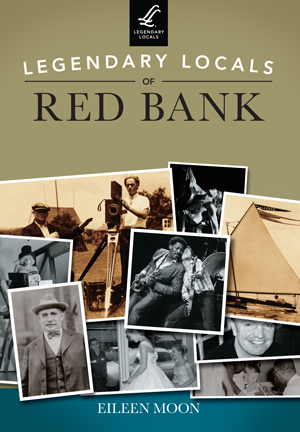 These are only a few of the legendary locals of Red Bank. Author Eileen Moon has written about Red Bank for more than a quarter century as a reporter, feature writer, and editor for the New York Times, Daily Register, Asbury Park Press, Two River Times, and many other publications.